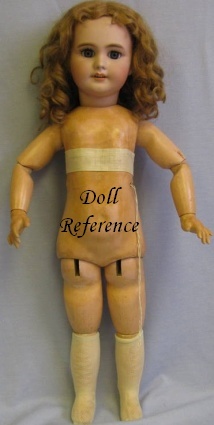 The DEP type dolls are called such, as they only have the DEP mark, plus a size number incised on the back of the dolls neck. No other doll makers mark, letters, symbol or mold number is present, as shown in the doll mark above, with DEP plus the size number 8. DEP bisque socket head doll shown above; 23" tall, marked only DEP 8, composition ball jointed body including wrists, wigged, feathered brows, real upper eyelashes, painted lower eyelashes, sleep eyes, open mouth with teeth. Many French or German antique bisque dolls have DEP in the doll marking, plus the makers symbol, letters etc. On a French doll DEP is an abbreviation for Déposé, on a German doll DEP is an abbreviation for Deponirt, both referring to a registered design in their respective countries. 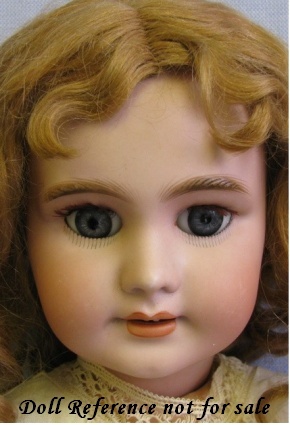 The earliest DEP dolls have a closed mouth, later dolls have an open mouth, some DEP dolls may have a Jumeau stamped head or body, some later DEP bisque heads are thought to have been made by the Simon & Halbig company.